Bulgari is helping set Christmas aglow with a mesmerising jewelled light installation in the Martin Place precinct. Crafted using thousands of individual LED lights, the festive decorations interpret the Roman jeweller’s most famous shapes. The coiling Serpenti centerpieces evoke precious garlands, while the Divas’ Dream collection becomes stylised Christmas trees. The shimmering display is on every evening from 6pm to midnight up until Wednesday December 28. 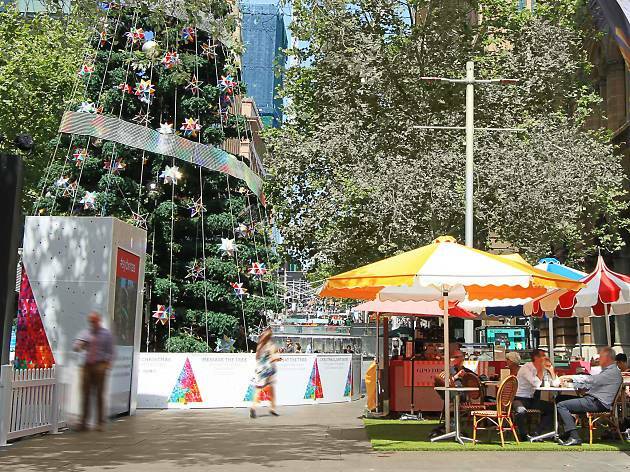 As well as admiring the light display shoppers and commuters will be able to visit the GPO Dessert Bar, installed in Martin Place next to the Christmas Tree. Visit the dessert bar for gelato, housemade sweets, cakes, coffee, cold beverages and savoury options, with casual seating available as well as views of the interactive Christmas tree. The GPO Dessert Bar is open Monday to Thursday 8am-10pm; Friday 8am-11pm; Saturday 9am-11pm; and Sunday 10am-10pm, up until Friday December 30. 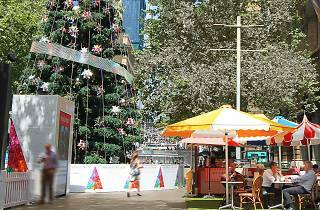 Bulgari Christmas Lights and the GPO Dessert Bar are part of sydneychristmas.com.au.